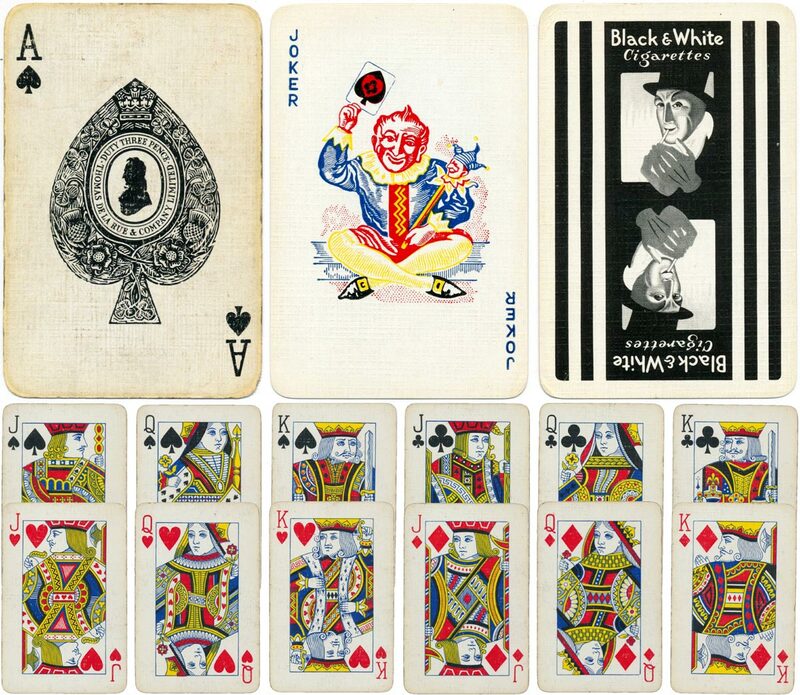 In around 1955 De la Rue introduced a new coloured joker and a series of aces of spades with a silhouette of Thomas de la Rue which coincided with the 125th anniversary of the granting to Thomas de la Rue of a Royal Letters Patent by King William IV for the printing of playing cards by the typographical process in 1857. 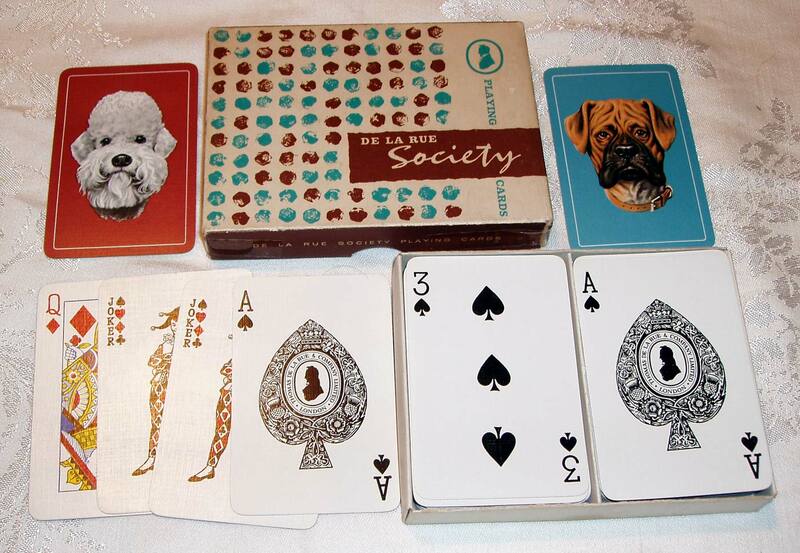 The silhouette aces of spades first appeared in c.1957 and underwent several changes in lettering and design, in particular when the three pence duty was dropped in 1960, but also including a white collar in some versions. The coloured joker is first known in July 1955 but was subsequently replaced by a harlequin joker in 1961. 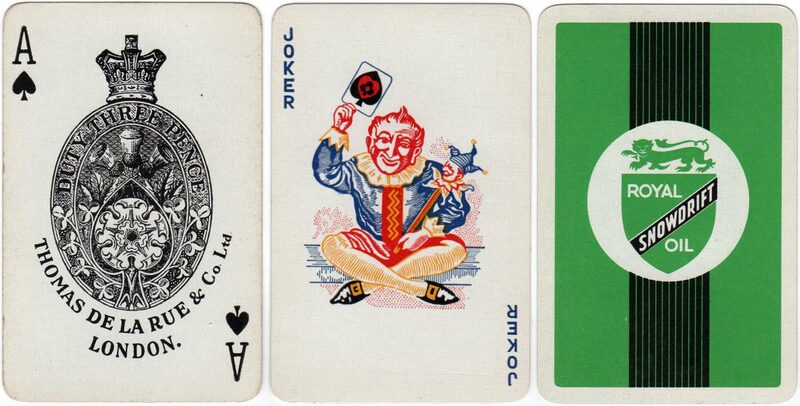 Above: De la Rue’s standard ace of spades with the new coloured joker instead of the earlier black and white version, c.1955. 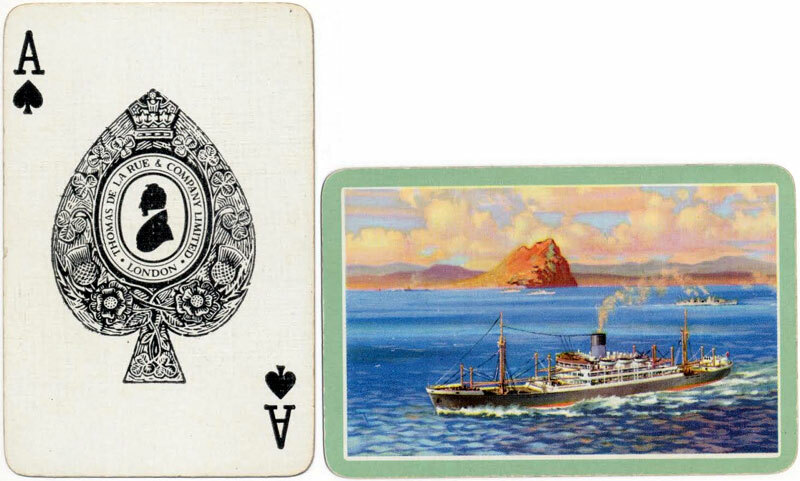 Above: Advertising deck with special ace of spades based on the conventional design, produced for Arthur Lee and Sons Ltd of Sheffield by Thomas De la Rue around 1958. 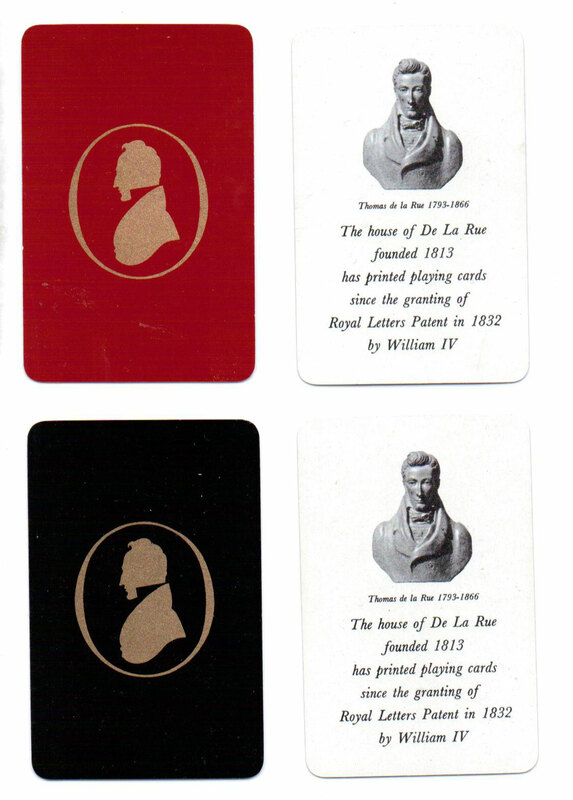 The deck contains two colured jokers and a security stamp bearing Thomas De la Rue’s silhouette. 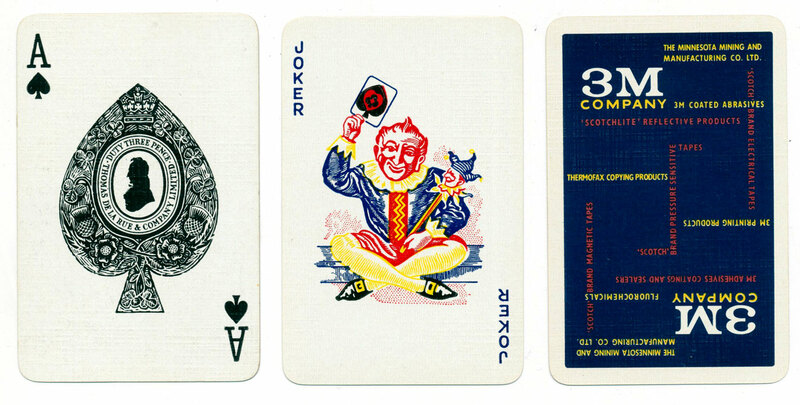 Above: De la Rue’s silhouette ace of spades with three pence duty and the new coloured joker for Black & White Cigarettes, c.1957. 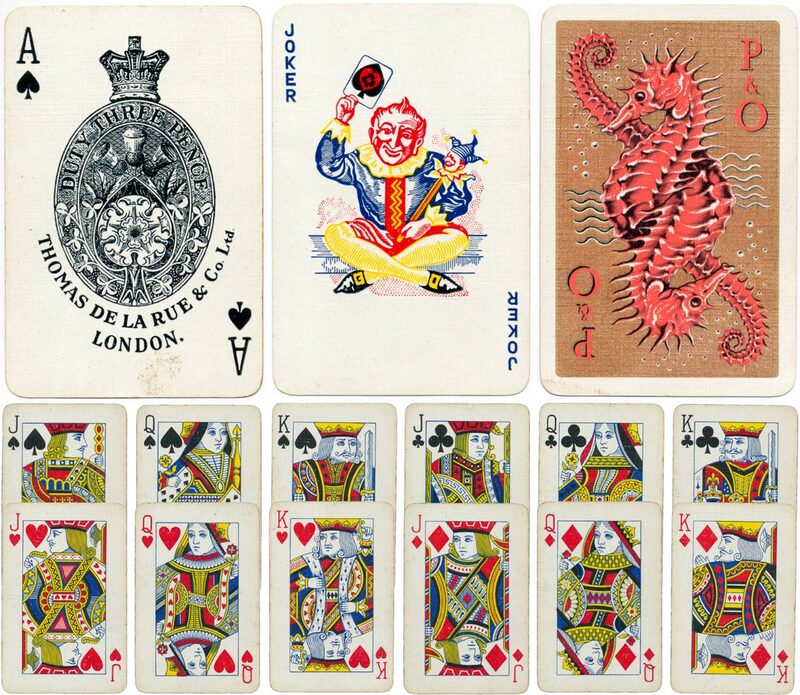 Above: export version of De la Rue’s silhouette ace of spades with the coloured joker, 1957-60. 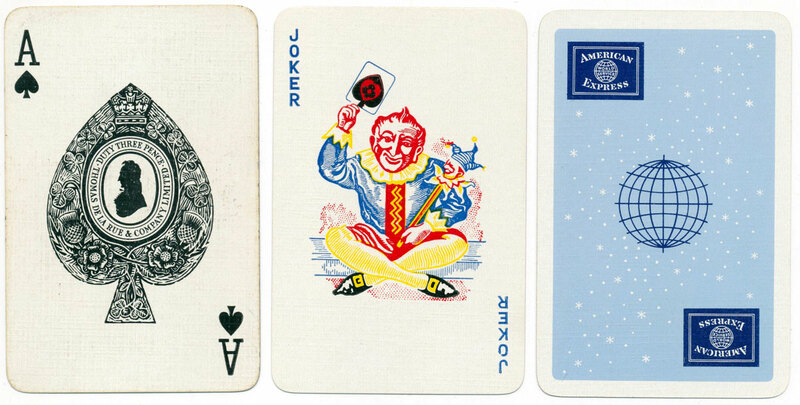 Above: De la Rue’s silhouette ace of spades with the three pence duty removed and the harlequin joker for the British Gas Council, c.1962. 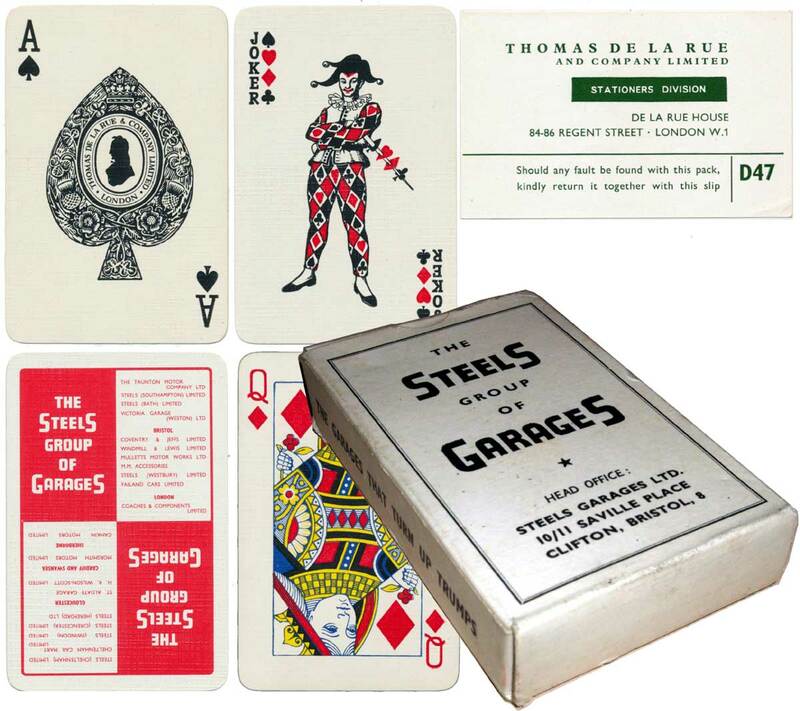 Above: De la Rue’s silhouette ace of spades with the three pence duty removed and the harlequin joker for Erskine Motors (Gosport), with security stamp bearing Thomas De la Rue’s silhouette, c.1962. 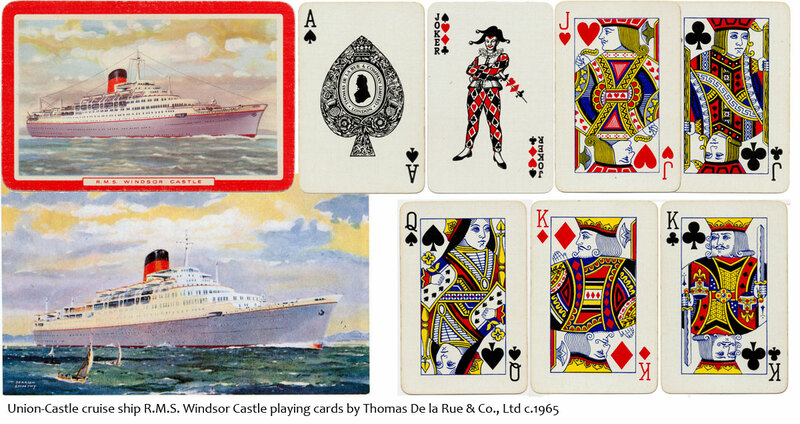 Above: advertising deck for Senior Service cigarettes with De la Rue’s silhouette ace of spades with a white collar, c.1965. 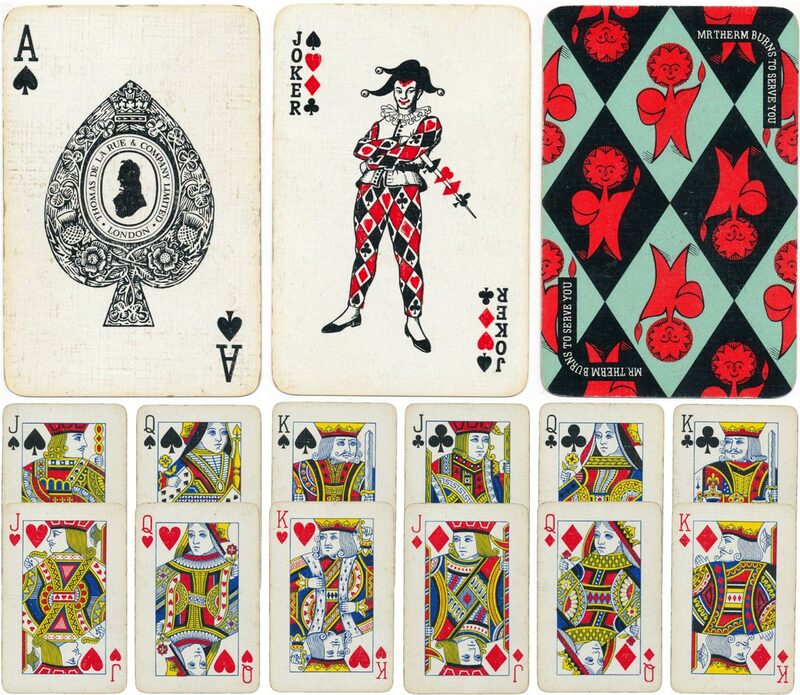 Above: De la Rue’s silhouette ace of spades with a white collar, c.1965-69. Tha ace gives the address as ‘London’, whereas the quality control slip gives the address in Leeds. 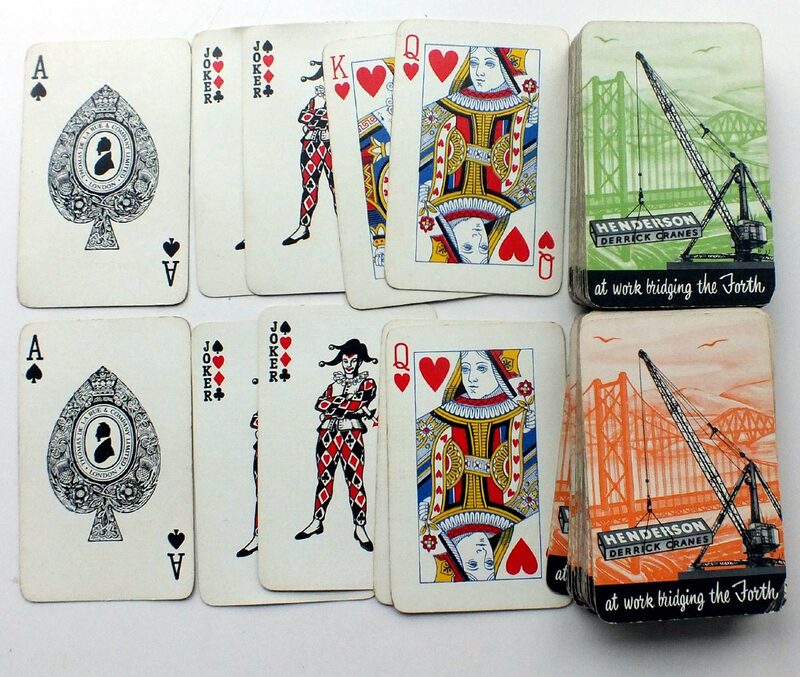 In 1969 De La Rue sold out to Waddington's, who then became Britain's leading playing card manufacturer. Wide sized ‘Wheel’ aces were probably made for export. They are found with or without the name printed at the foot. Also used by Waddingtons in ‘Zodiac Club Playing Cards’ for Pepys with Goodall courts, after Alf Cooke had been bought out, with ‘Wheel’ backs, c.1972. 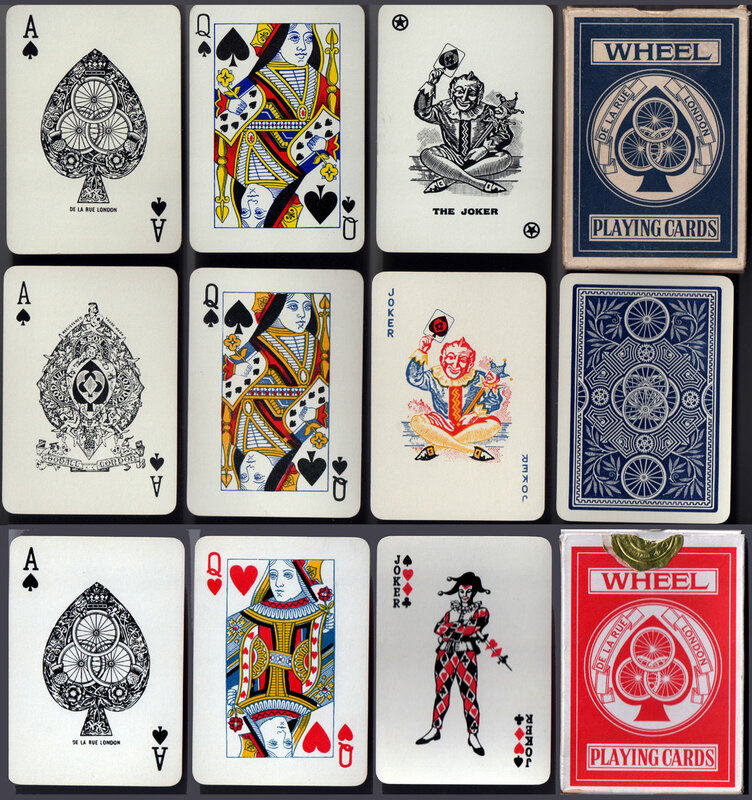 Above: various De la Rue aces of spades, including the ‘Wheel’, with versions of the joker, 1950s-1970. Top: DLR Wheel printed by Waddington, c.1965. 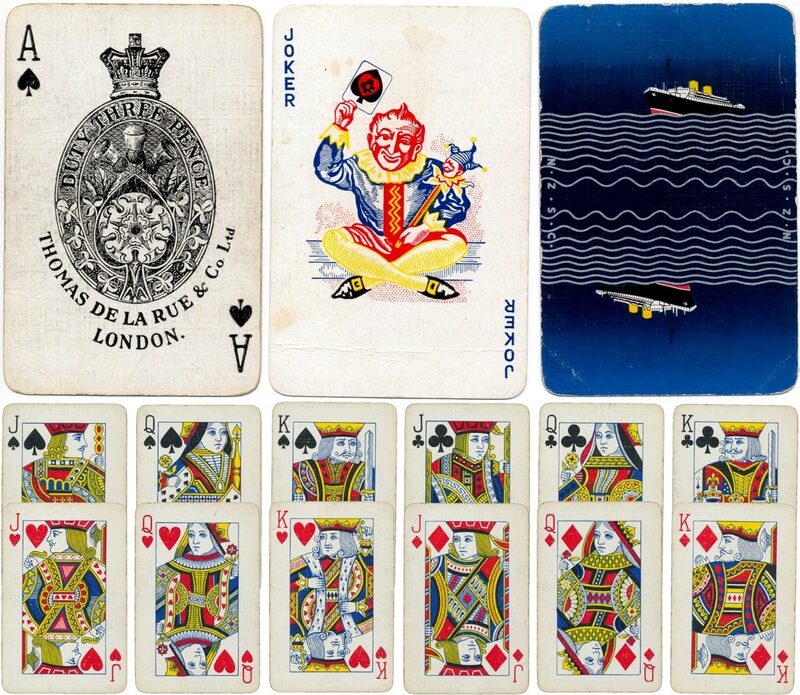 Middle row: DLR Wheel, same box as above, with Goodall & Son ace and bridge courts on wide cards, c.1956 or later. Bottom: DLR Wheel AS with letterpress bridge courts on wide cards; APCC on gold box seal, c.1968. Images courtesy Ken Lodge. Thanks to Matt Probert for images and Ken Lodge for additional research.